​HUNTSVILLE, AL - August 10, 2018 - 115. This is the number of people who die from a drug overdose every day in the United States. Not One More Alabama (NOMA) is an organization that is working to raise awareness about this issue. It's working with parents to teach them warning signs which indicate their child might be using drugs. Addiction is a destructive force. "It's a disease. It's a chronic, progressive brain disease that if we don't do something about they end up either incarcerated or dead," NOMA Vice President Shannan Roberts said. The nonprofit organization works to help parents steer their children away from addiction by teaching them the warning signs. This is why they built the drug awareness discovery room. "There's a lot of signs that we can really miss. It will look like a normal teenager's bedroom and then all the sudden you're noticing things after you found out they've been using for a while and you're like "ah" that's what that was," Roberts said. The trailer is a replica of a teenager's bedroom. It shows how the signs of addiction often hide in plain sight. There are many things kids can use to hide drugs. For instance, a desk holds many examples of things parents should be aware of. "You will see when they're starting to shoot up. they're taking these little pieces off the ends of a q-tip," Roberts said. A container of mints? It might not be as innocent as it looks. "They have the Altoids can sitting here and these little Altoids, or they look like Altoids, could be any pill," Roberts said. The death toll related to overdose deaths continues to rise every year. But, NOMA says knowing these warning signs can help stop addiction before it starts and ultimately saves lives. The Drug Awareness Discovery Room will be on display at the End Heroin Huntsville walk. It takes place Saturday, August 18th. Visit Notonemorealabama.org for more information. ​Huntsville, AL - July 2018 - Not One More Alabama (NOMA) is proud to announce the dedication of the new resource trailer, The Discovery Room, created to assist parents in the battle against drug use by their children. In a partnership with Leadership Huntsville Small Group, this trailer is designed to simulate a typical teenager’s bedroom. Parents will be invited into the trailer to “discover” some of the telltale signs of a child using and hiding drugs of all kinds. It demonstrates the need for parents to remain vigilant and aware of the everyday activities of their child. Small changes in their bedroom can be an indicator of serious changes in their behavior. This trailer is the result of months of coordination between Leadership Huntsville Small Group and NOMA along with generous donations from: Leadership Alabama, Torch Technologies, WHNT, Jeffrey’s Sign and Banner – Tom Jeffery, Sherwin Williams – Eric West, James Carpets – Scarlett King , Ed Gallup, The Saturday Morning Group, Greg Johnson and NOMA. The trailer is dedicated in loving memory to Jay Barton, a 2002 graduate of Huntsville High that lost his life on July 5, 2016 to addiction. Keeping unused, unwanted and expired medications in your home poses a risk to you, your family and your community. When disposed of improperly, medications can still be obtained for illegal use or can contaminate our waters. Prescription drugs, over-the-counter medications and supplements are involved in over half of unintentional child poisoning incidents. 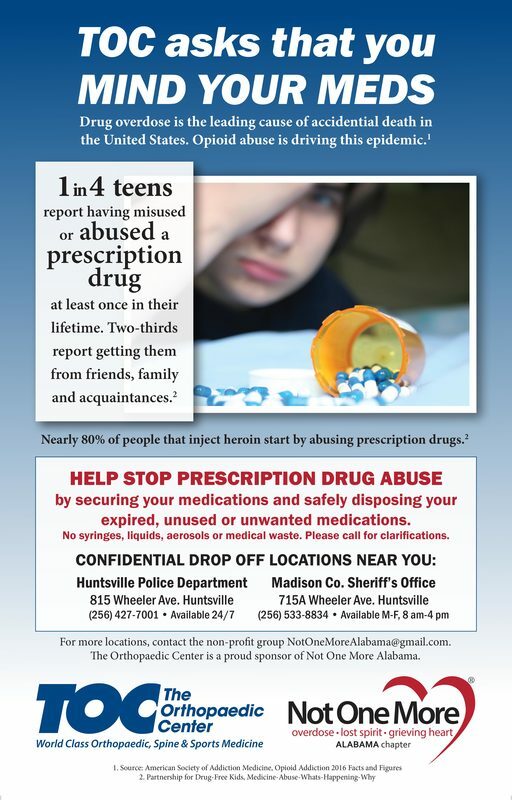 Two-thirds of teens who report abuse of prescriptions medicine are getting them from friends, family and acquaintances. Make sure the teens in your life don’t have access to your medicine. Prescription drug abuse is a serious and growing problem in our community. Abuse of medicines is increasing rapidly with serious consequences. Safely dispose of unused prescription and over-the-counter medications 24/7. Brought to you by law enforcement agencies serving Huntsville and Madison County residents. Drop Box accessible Monday - Friday 8 a.m. – 4 p.m.
Law enforcement and volunteers will be present to ensure safe and legal collection. Place loose pills and containers of liquids in a zip-top bag before depositing. Medications in original containers should have personal information removed. Bring medications to the secured drug collection box. Drop medications in the box. Please join us as we introduce our organization and share our mission to provide support to families and members of our community struggling with addiction in their lives. Addiction knows no boundaries and impacts individuals regardless of age, gender, race, income or religion. Help us fight the stigma attached to those that are struggling, comfort those already injured but not destroyed by this disease, and inspire young people to stay drug-free. We want to fight this disease with education, love and compassion, and together we will rise out of the darkness and into a place of light, recovery and peace. Thank you to our event sponsors: The Reprieve for Men, Opelika; A Reprieve for Women, Tuscaloosa; and FORMLL - Friends of Recovery Morgan, Madison, Limestone and Lawrence counties. For more information about Not One More Alabama or the event Thursday, April 13th, please call (256) 384-5055 or email NotOneMoreAlabama@gmail.com. Not One More Alabama is a 501(c)(3) organization. Impaired coordination, injuries/accidents/bruises that they won’t or can’t tell you about - they don’t know how they got hurt. Unusual smells on breath, body or clothing. Declining attendance and performance at work--loss of interest in extracurricular activities, hobbies, sports or exercise--decreased motivation. Complaints from supervisors, teachers or classmates. Isolated, silent, withdrawn, engaging in secretive or suspicious behaviors. Using eye drops to mask bloodshot eyes and dilated pupils. It's Saturday morning, February 25, 2017. I wake up at 6:15 a.m. anxious to get to this walk I'm involved in and scream "JAY?" Tears start flowing down my face and I'm having shortness of breath. Another dream, another reminder that I can't kiss my son, smell my son, hug my son, tell him how much I love him, tell him how proud I am to be his Momma, tell him he has gorgeous blue eyes and Melissa is quite a lucky lady, watch him play with his precious niece Brinkley and little Finn man, watch him play softball, meet him for lunch, find out how his day was, or have him over for our routine Sunday night supper after a round of golf together with his Daddy! We get up, eat breakfast and hurry to the park to meet my friends from NOT ONE MORE ALABAMA and their families. I have a best friend with me from Huntsville, Shawn Bentley and three friends from Atlanta: Deborah, Diane, and Cindy. They are four parts of my rock star friends that are ALWAYS there for me! I see thousands and thousands of people! People with shirts on slamming heroin, signs with pictures of love ones who are gone or who are in therapy, buttons on shirts with an addict’s picture; like the 13 buttons with Jay's picture on them from all of the sports he played. TEARS start flowing again. I meet up with my group and love seeing the matching shirts with NOT ONE MORE ALABAMA on them. We get a group shot and here come the tears again. I personally know what all these people feel like. I hate it, but I can relate to the pain. I know what it’s like to feel that knot in your throat, that fear. The fear that death is coming, that you've done everything you can think of to help your loved one. You're broke, you're tired, you are absolutely longing for a day, just one day when you can feel like that loved one is safe, safe from the devil. To me, fear is this: Feeling Every Addicts Reality! Well, I felt it for over 12 years. 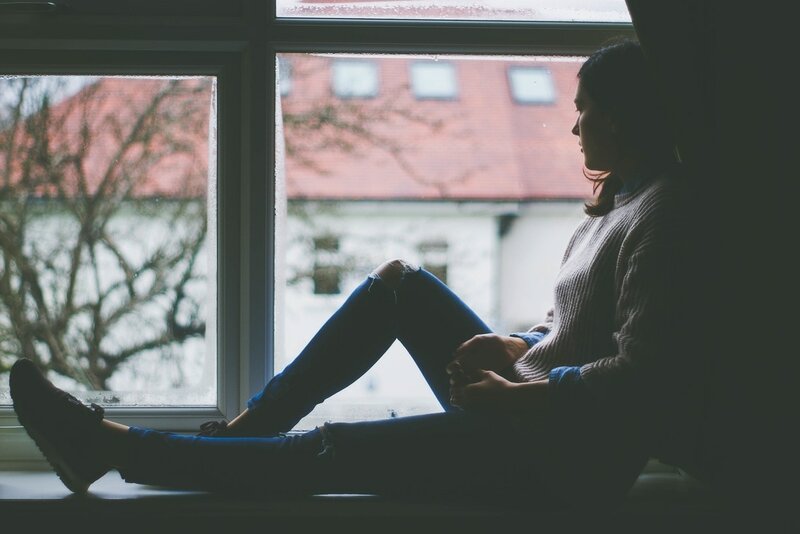 The going in and out of recovery, praying that this time he could beat it, going to AL-Anon meetings because I thought I was crazy – are just some of the fears. Jay Barton, my precious son, my only son was born on May 19, 1984. He died on July 5, 2016 at 3:15 a.m. in the morning with a needle in his left arm and his chip in his right hand. That needle was NOT heroin. It was mixed. This Birmingham walk was a blessing to me. Knowing that there are thousands of people out there that you can turn to for help with recovery, addiction, love and support is a very heartwarming feeling to me. It's a feeling that I have longed for since July 5, 2016. I'm a Momma who cares, who is not ashamed, who feels a calling to help others get through this fear, this nightmare, this train wreck. Not One More Alabama is a way for us to fight! God set my son free! Free from the devil! God also set me free, Free from FEAR! I do not feel alone anymore. The only way to fight the devil is to LOVE! The Birmingham walk was a whole lot of Love! Not One More Alabama is a whole lot of LOVE! That walk was a day where God made the sky a gorgeous blue color just like my son Jay's eyes. God is up there smiling at all of us because he knows we care together and together we can fight this evil heroin epidemic with LOVE. I will spend the rest of my life helping to fight this disease because I have God on my side.